Sometimes art or history can provide a spark of inspiration for a puzzle. 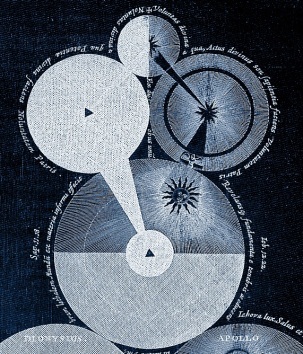 In this case, we have a detail from a work by Robert Fludd (1574-1637). Fludd was highly influential in Elizabethan England, but picking fights with far better mathematicians such as Kepler and Mersenne did nothing to promote his vision of a kind of mathematical-theology. Indeed, his promotion of a two-worlds theory (terrestrial and celestial, or mundane and heavenly) was precisely the idea attacked by Kepler and Galileo and later refined by Newton. But enough history, let's look at the picture! Trying to clean up the original I noticed that its negative is far clearer and shows more details, so that's what I've posted. 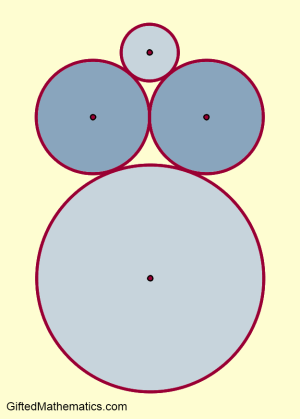 The image shows a large circle at the base, with two medium-sized circles touching each other and the circle beneath them. Finally, the image is crowned by a small circle touching the medium ones. What's Homer Simpson doing here? Using the schematic diagram on the right, assume that the medium circles are half the diameter of the large one, and that the smallest circle is half the diameter of the medium ones. Take the radius of the large circle as equal to 1 unit. Calculate the distance between the centre of the large circle and the centre of the small circle.